The book of Revelation holds some complex and intense imagery, but eighteenth-century scientist and philosopher Emanuel Swedenborg found a beautiful promise for the future beneath the sometimes frightening descriptions in the literal text. And what’s more, the visions described in the biblical book reveal a better way to live today. In this episode, host Curtis Childs and featured guests explore the inner meaning uncovered in the Bible during Swedenborg’s mystical explorations of the spiritual world. Join in as they go through the first chapter of the book of Revelation to explore the spiritual meaning of the vision and the symbolism of the seven stars and seven lampstands that John saw. While Swedenborg worked within a Christian framework, his understanding of the spiritual realm can guide people from any background. The vision that John had on Patmos revealed universal truths. Who was John? The actual historical identity of the person who wrote the book of Revelation is a matter of speculation, but Swedenborg says that when John introduces himself as “your brother and companion” (Revelation 1:9), he’s setting the stage for understanding this vision. 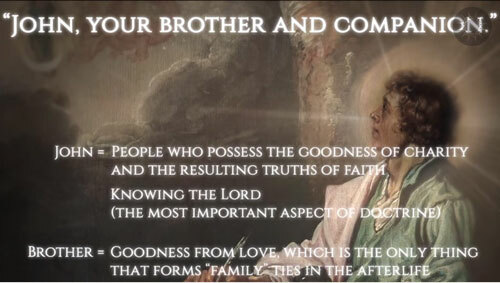 John represents the goodness inside each one of us that connects with God and with each other. 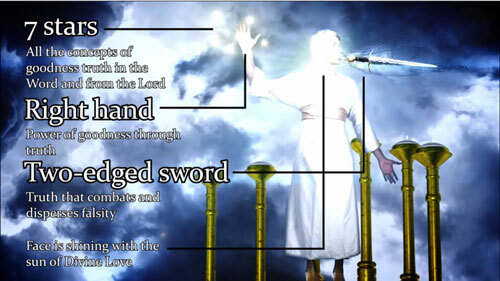 Swedenborg’s analysis of Revelation 1:9–11 speaks to a yearning for divine love, having a sense of isolation from God and then feeling that divine presence flow into you. 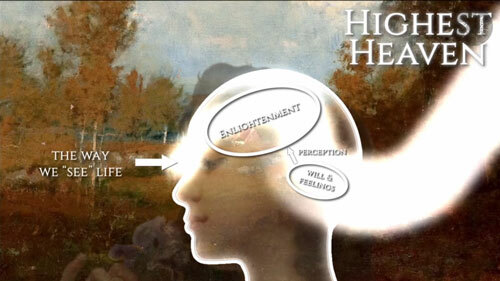 The events of the vision, Swedenborg says, will happen in reality on a spiritual level but not a physical level. But before we can delve further into the imagery, you should know that even Swedenborg struggled with the meaning of Revelation. Dr. James Lawrence discusses the difference between Swedenborg’s multiple works on Revelation. May I Speak to Your Cerebellum? In his vision, John heard a voice and turned around. In order to understand why that matters, we need to understand how the human brain works. Swedenborg, in addition to his many other talents, had studied human anatomy, and his early writings analyzing brain function are acknowledged by modern neurologists to be far ahead of his time. In Apocalypse Explained (§61), Swedenborg says that the reason the voice came from behind John is that divine energy flows into us through the cerebellum, which is located at the back of our skull. He connects the cerebellum with a part of our mind called the will (which contains our feelings) and our cerebrum with the understanding or intellect, where thoughts occur. Understanding Swedenborg’s scientific approach to spiritual matters can be difficult, so Karin Childs shares a personal story that helps to clarify. Once John turned, he saw seven lampstands. These also have an inner meaning: enlightened by the love he has received from God, John now realizes that there are many others guided by the same compassion and sense of altruism. These people will be part of the new church, the spiritual age that is to come. We’ve made it through verse 12! Ready to move on? 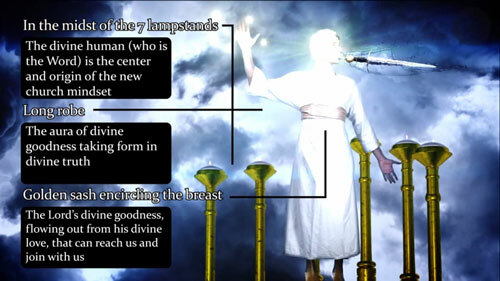 Revelation 1:13 describes a figure “like the Son of Man” dressed in a long robe with a golden sash. This figure is in the middle of the lampstands—that is, he is the center of this new spiritual mindset—with clothing that symbolizes goodness taking form and reaching out to join with us. But although clothes make the Son of Man, they’re far from the whole story. In the next part, we explore more details about this figure. 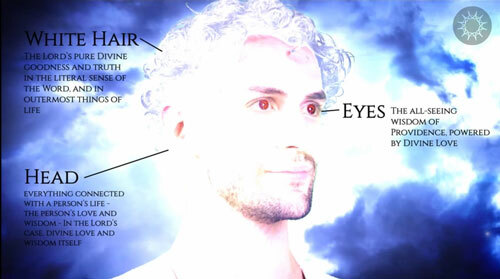 John describes the figure he saw as having white hair and red eyes. The image seems frightening, but it means so much more. The hair represents purity of goodness and truth, and the eyes represent the wisdom of providence powered by the fire of divine love. His feet were brass, representing divine goodness on earth. The vision gets even stranger from there when John sees a sword protruding from the figure’s mouth. This—combined with the seven stars around the figure’s hand—represents divine truths coming to earth and combating false ideas. Before we go on, a quick break for a fan video: a fan shares the story of how she discovered Swedenborg and suggests a correspondence between humans, fruit trees, and weeds. Perhaps unsurprisingly, when John encountered the Lord, he fell on his face. God is like the sun: he sustains life, but that doesn’t mean it’s safe to get too close. The Lord’s divinity is so powerful that it’s difficult even for angels to be in his presence. When John collapsed, the Lord reached out to him to share his strength. Then the figure speaks: “Do not be afraid; I am the First and the Last. I am he who lives, and was dead, and behold, I am alive forevermore. Amen. And I have the keys of Hades and of death” (Revelation 1:17–18). Here we have the offer that the Lord makes to all of us: to fill us with life, love, and faith, and to save us from the mindset that leads us to hell. All this symbolism has a point—it’s a blueprint for a new church. At this point in the vision, the Lord explains the symbolism of the seven stars over the seven lampstands. 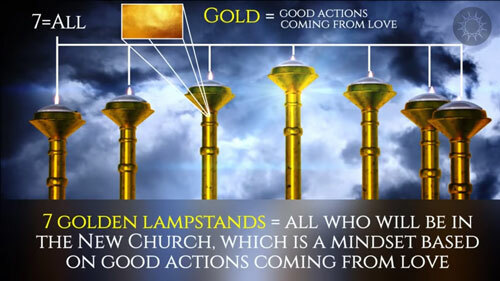 In other words, the seven lampstands represent seven churches, meaning seven different mindsets or approaches to religion that together create a perfect understanding of spiritual truth. These lampstands, or churches, reappear at the end of Revelation: the vision of a beautiful spiritual unity at the beginning is fulfilled at the end of the vision. The chapters in between depict all of the obstacles that stand in the way—but that’s a story for another time. It’s a long path, but in the end it will take us to a better world. In the meantime, here’s a visual meditation on the meaning of all of the imagery that appeared in this episode. Is there a question that Curtis has that Swedenborg doesn’t address? I’ve been watching many episodes but I’m not clear on if we come into this life from the spirit world and then return to it? Do we only live a life once? 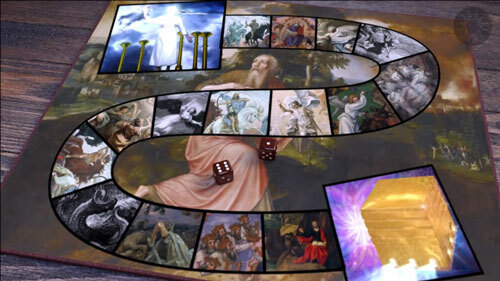 Since many centuries have passed since the writing of Revelation and the symbolic interpretation we’re seeing now, is further more enlightened interpretation to be expected in future centuries? If church means “state of mind and heart,” why not just translate it as that instead of the word “church,” which holds such negative connotations?